Tarot for Change: Why everyone should have a tarot reading? Yes, I'm a tarot reader and this topic might sound like a marketing blurb, but I actually have a deeper point. I've mentioned before that I'm a PhD student and I'm currently writing my thesis revolving around the themes of quality of life and quality of urban environment, and the connection between them. Due to and alongside my studies, I read a lot about experience economy and the importance of meaningful experiences in life. Helping to improve everyone's quality of life is a passion of mine and that's the main reason I started this blog and offering tarot services. It's been studied and confirmed by a vast number of psychologists, sociologists and other human sciences professionals, that people have an innate need to find purpose in life. We simply can't function properly if we don't see a purpose for our existence and actions. We become depressed, disengaged, directionless... miserable. In the worst case scenario, lose the will to live. Scientific and academic professionals, as well as business and marketing experts, have figured out something else, too. That people everywhere seek meaningful experiences: moments or a lifestyle that allow us to experience something new and unique, grow as a person, master a skill, feel connected with others in a positive way, be creative, contribute to the society, feel more alive. These experiences are important, because they help us to find the meaning and purpose in life - it's not just about taking mechanical actions to survive, it's about building relationships, memories and skills - and growing as a person. Business consultants Steve Diller, Nathan Shedroff and Darrel Rhea have written a book Making Meaning about the work of Cheskin consultancy company: it surveys 100,000 people around the globe per year to map, what people want out of life. They've compiled a list of the most often mentioned experiences that come up in these surveys - what people everywhere seem to value and yearn. Accomplishment - Achieving goals and making something of oneself; a sense of satisfaction that can result from productivity, focus, talent, or status. Beauty - The appreciation of qualities that give pleasure to the senses or spirit. Community - A sense of unity with others around us and a general connection with other human beings. Creation - The sense of having produced something new and original. Duty - The willing application of oneself to a responsibility. Enlightenment - Clear understanding through logic or inspiration. Freedom - The sense of living without unwanted constraints. Harmony - The balanced and pleasing relationship of parts to a whole, whether in nature, society, or an individual. Justice - The assurance of equitable and unbiased treatment. Oneness - A sense of unity with everything around us. Redemption - Atonement or deliverance from past failure or decline. Security - The freedom from worry about loss. Truth - A commitment to honesty and integrity. Validation - The recognition of oneself as a valued individual worthy of respect. Wonder - Awe in the presence of a creation beyond one's understanding. A tarot reading at its best can offer a pathway to a number of these and hence, be a very powerful, mind-shifting and influential experience. The main purpose of tarot is to offer enlightenment: an avenue to understand something - one's own or someone else's thoughts, emotions and feelings, or the situation or life in general - with new clarity. It can also help one experience truth, justice, duty and security (what's really going on and why, what are the "karmic lessons", how this all fits to the grand scheme of things, what's the likely direction and how to put in the best effort to achieve a goal). Tarot is an excellent tool for redemption - understanding that the past failures have served a purpose and there's always light at the end of the tunnel. Beauty and harmony can be experienced by looking at the beautiful and interesting pictures and having the sense that life in itself is a beautiful experience full of new beginnings and new chances. Most thoughtful tarot readers offer a calm, harmonious settings for receiving the reading - a bit like a mind spa - or tailor a beautiful email package of the reading as a keepsake. Accomplishment and freedom can be felt, when the cards prompt us to take action to achieve goals, and remind that we are free to change our lives, when we first acknowledge what's the blockage - fear of failure, something else? Creativity is also supported by a tarot reading, because the purpose is to give the sitter free hands to mould his or her life to the wanted direction by giving the most useful tips about what's working and what's not. In my view, possibly the most impacting emotions can come from experiencing validation - what you're going through is real, the reader can see it and empathise with you, and the reader is focusing solely on you. No distractions, no checking the phone, but your life being discussed and described in depth and with empathy. Oneness and wonder can be experienced either from a spiritual point of view (the cards are seen as giving higher guidance); or simply from the fact that there is a connection between the reader, the cards and the sitter and it's an awe-inspiring experience to see a flow of pictures describe your life to a T and offer insightful advice. Belonging to a community is one of the core needs of every human being and it is experienced during and as a consequence of the reading by first connecting with the reader and later on, by applying the tarot messages to your life to improve how you connect with others - with a partner, family members, friends, colleagues or people in general. When people come to receive a tarot reading in person, they practically always forget the flow of time, which is a tell-tale sign of deep impact and focus. People simply don't remember to check the time or don't realise an hour has passed already, because they are so intrigued to hear what the cards mean. A tarot reading is not only informative or clarifying, it can be an all-encompassing and unique experience that fulfils a number of everyone's deep needs and often is a memorable event people remember for years - if not their whole life. EDIT; Doing a reading for oneself can and does offer these same feelings and experiences. If you can understand the cards, there's of course no necessity to seek a reading from another person - even though that can be extremely helpful when feeling blocked or confused with the situation and/or the cards! Death - or a rising Phoenix. When one life phase ends, another begins; tarot can help with the transition and transformation. 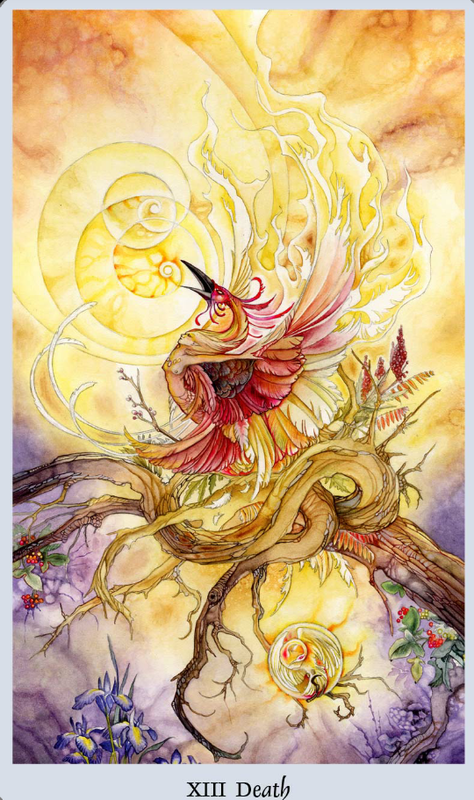 From the Shadowscapes Tarot by Stephanie Pui-Mun Law.